I discovered the fabulous combination of mayonnaise and cranberry sauce about 10 years ago when I was working in Edmonton. The Safeway grocery store across the road from my office made subs perfect for lunch in their deli section. I tried the Thanksgiving sub which featured leftover turkey, cranberry sauce, mayo and some fresh veggies. OMG was it good! Since then, I can’t get enough of this delicious flavour combination. You need to try it! I used turkey deli meat, but leftover turkey would also work nicely. 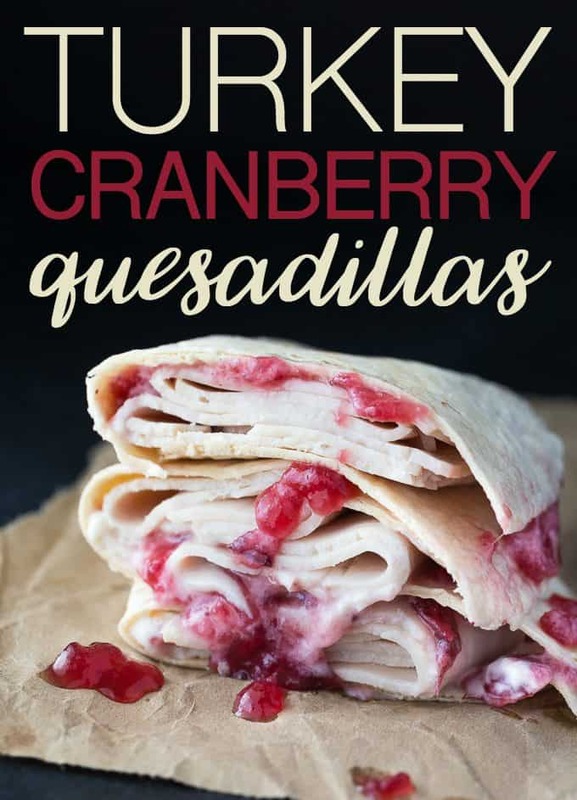 Serve these Turkey Cranberry Quesadillas as is or heat them up. I like them cold personally. The best part is that this recipe is so easy that even a kid could make it. It takes barely a minute to throw together. Have you tried mayo and cranberry sauce together? Easy peasy! Sliced turkey deli meat is smothered in creamy mayonnaise and sweet cranberry sauce. 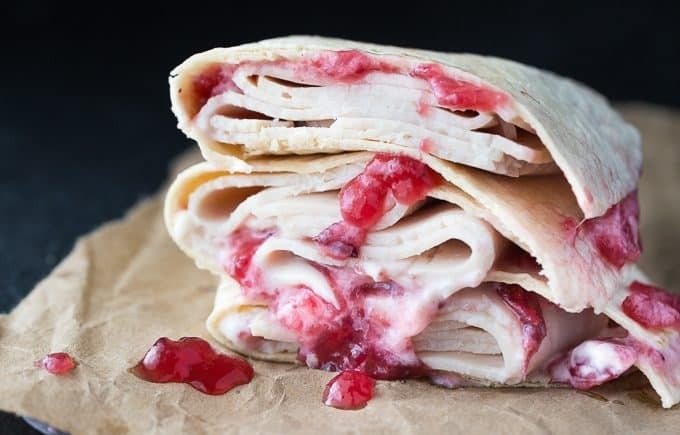 Spread 1 tbsp of cranberry sauce and 1 tbsp of mayonnaise on half of each the tortillas. Fold 2 turkey deli meat slices on top of mayonnaise and cranberry sauce. Fold tortilla in half and slice into two pieces. 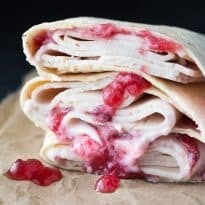 Cranberry and mayo is an awesome combo! I also like it on a veggie sandwich! MMMM. Sometimes I swear the leftover creations are better than the initial dishes! This is a great idea! Totally trying this next time I have some cranny sauce lying around! I would have never thought to put mayo and cranberry sauce together. Now I need to get some turkey. Thanks for sharing. Sounds good, good way to use up those turkey leftovers that are hanging around. The combination of turkey and cranberry sounds amazing! These look really mouth watering! Happy new year & thanks for sharing! Yum…all the good stuff in one quesadilla! 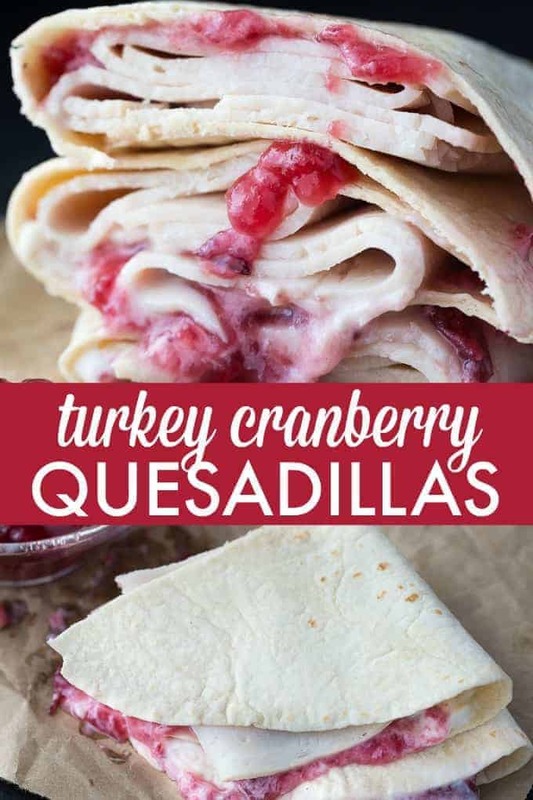 These Turkey Cranberry Quesadillas look so good. I have a sister-in-law who is a very picky eater, but she likes cranberries and she loves tortillas so I can’t wait to share these with her! Thank you for sharing at the Celebrate It Blog Link Party. I can’t wait to try this it looks so delicious ! This looks incredible! I would love to try this recipe because i have a feeling that my daughter would love this.